This blog is part of Disease Detectives, a series which showcases PHE science. How body piercings and unsafe aftercare led to a national outbreak of Pseudomonas Aeruginosa. Everyday people in the UK choose to have body piercings and hopefully most go smoothly and don’t result in problems. However when a number of people from the East Midlands and the South East who had recently had body piercings became ill with Pseudomonas aeruginosa which can go onto cause sepsis and disfigurement of the ear lobe, we as epidemiological scientists needed to undertake some detective work to determine if there was a link between them and to prevent others getting ill.
On 31 August 2016, the PHE centre in the East Midlands was alerted by the local Ear, Nose and Throat (ENT) hospital department that there was a cluster of six cases of ear abscesses following piercings at an East Midlands piercing studio. Four of the six abscesses tested positive for P. aeruginosa, a bacterial infection which can have serious health implications. The ENT team were concerned that there might be an outbreak related to piercings at the studio as it was unusual to see so many abscesses like this. 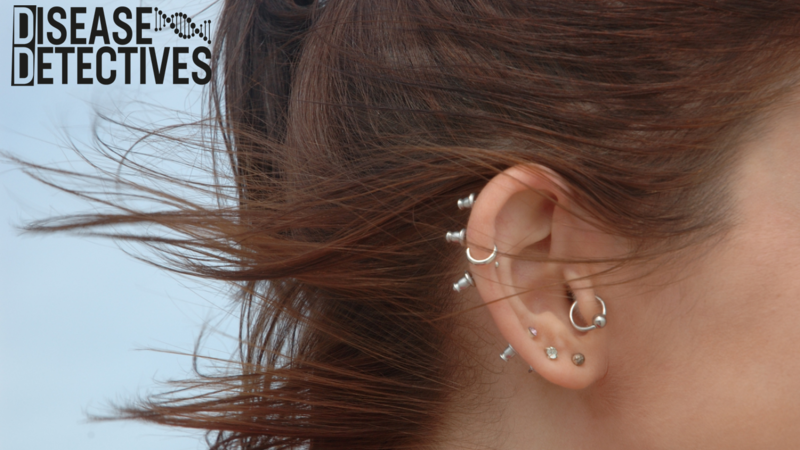 However it soon became apparent that the situation was more widespread when the PHE centre in the South East was also alerted to eight ear abscess cases (four with confirmed P. aeruginosa infection) following piercings at a local studio. Although the two outbreaks could have been coincidental, the similarities between them suggested there might be a common issue causing the problem. However we needed to do further work to understand if they were definitely linked and if so how given the studios were more than 100 miles apart. As epidemiologists, our role is to identify abnormal patterns in health and illness in the population; and to detect outbreaks of disease early to prevent more people from getting ill.
A multi-agency national outbreak control group, involving the local authority, PHE, NHS England, the local Clinical Commissioning Group and the manufacturer, was convened to investigate the outbreak. Working with our environmental health and health protection colleagues we were rapidly able to identify that a nationally distributed aftercare solution, produced by a single manufacturer in the East Midlands, was common to both studios. From previous experience and the published scientific literature we thought that this aftercare solution was likely to be the probable source. We notified GP’s and Accident & Emergency departments of the incident and signposted a clear pathway to them for reporting any suspected cases. Environmental Health Officers (EHOs) visited the two piercing studios in the East Midlands and the South East where they reviewed piercing procedures and took microbiological samples of common products in use including cleaning products, skin puncture needles, jewellery, piercing equipment and bottles (opened/unopened) of aftercare solution. EHOs and Trading Standards visited the manufacturing site of the aftercare solution in the east Midlands to review the production process, sample the equipment and materials used in its manufacture to check for contamination and to determine the extent of the distribution chain and identify what quality control was in place. Once the manufacturer had identified which piercing studios the aftercare solution had been distributed to, we contacted them and requested they contact their clients to advise them to stop using the solution immediately. The manufacturer also voluntarily recalled the product from sale. The manufacturer of the aftercare solution was issued with a prohibition notice to cease manufacture and supply of the product. Finally, the media were asked to help us warn and inform the public that this particular aftercare solution wasn’t safe to use. Our work however doesn’t stop at just identifying the cause of the outbreak. In serious incidents like this, which are nationwide, we go further into the detail to produce the evidence and statistics to explain how an outbreak or incident occurred. Alongside our microbiological sampling, we also undertook what is called a ‘retrospective cohort study’ for the two piercing studios. This involved sending an online questionnaire to clients who had been pierced at either of the studios between July and the beginning of September 2016. The questionnaire aimed to gather as much information from each client as possible including any medical history, piercing details and use of the aftercare solution. There was strong environmental, microbiological and descriptive epidemiological evidence that the outbreak was caused by the use of the aftercare solution which was distributed nationwide to at least 38 piercing studios, 10 of which had cases. Confirmed and probable cases were identified across England but most were from the East Midlands and South East. The microbiological investigations were particularly crucial to tying the parts of this outbreak together. All the cases (apart from one) from the East Midlands and the South East, tested positive for the same, unusual, not previously seen type of P. aeruginosa. In addition the same bacteria was found in unopened and opened bottles of the aftercare solution and on some of the equipment and materials used to manufacture the product. From over 222 responses to the questionnaire we concluded that using the aftercare solution increased the odds of developing a post-piercing infection by four times. Overall we identified 162 outbreak cases, 29 of which were confirmed. 1 in 8 of the cases required surgery under general anaesthetic. You can read more about the investigation here. 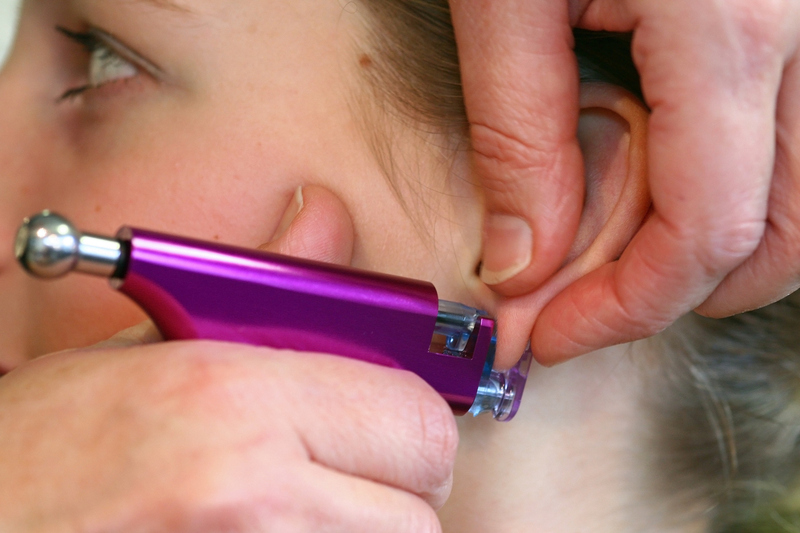 This outbreak demonstrated some of the challenges around educating the public and the piercing industry about the voluntary codes for piercing aftercare and ensuring they use them. Similarly the cosmetic production regulations were not being followed by the manufacturer. Compliance with both of these could have prevented this outbreak. This outbreak and the challenges in regulation, highlight that guidance on piercing aftercare may need to be reviewed and suggest that there may be a case for greater regulation of the quality and safety of products used for wound cleansing in the piercing and tattoo industry. Piercing literature was very interesting and confirms the diligence taken in investigations by PHE. I personally will not have any piercings. Forget cleaning solutions from a bottle, dissolve quality salt in boiled water, cheaper and more effective.